The recent meeting of the foreign ministers of Russia, India and China (RIC) in Beijing underlined the continued relevance of the RIC trilateral and its role in addressing a host of cross-cutting issues, including terrorism and promoting a rules-based global order, says Debidatta Aurobinda Mahapatra. 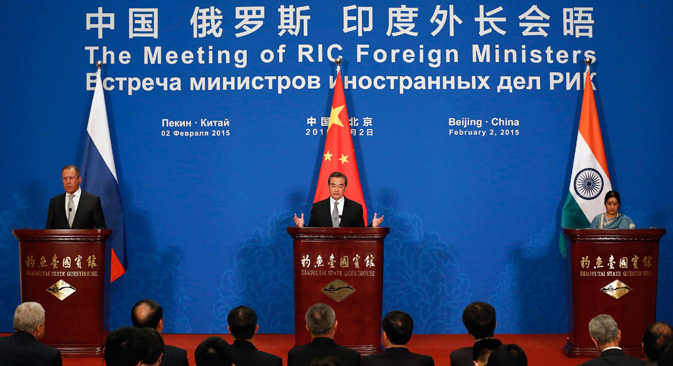 The foreign ministers of Russia, India and China recently participated in the 13th RIC meeting, and expressed joint resolve to fight terrorism and promote a stable and multipolar world order. One of the key achievements of the trilateral meeting is the declaration of common position on terrorism. Russia and China expressed support to the long-standing Indian initiative, Comprehensive Convention on International Terrorism (CCIT). When India initiated this proposal at the United Nations in 1996, terrorism, particularly international terrorism, was not much debated in international circles, and some nations thought of it as acts committed by stray elements. The situation is totally different now. Religious terrorism is a major concern for any multiethnic and pluralist society. The new phenomenon termed the Islamic State has set new standards of barbarism. Closer home, terrorism in Afghanistan, Kashmir, Xinjiang and North Caucasus has challenged the state legitimacy, and created instability. The RIC collaboration in developing an international legal framework to fight terrorism is timely. This also shows seriousness of the three countries, also victims of the terrorist violence, to fight together. The CCIT will have two main goals. First, it will empower the international community to oppose use of terrorism under any guise. The ministers argued that “there can be no ideological, religious, political, racial, ethnic, or any other justification for acts of terrorism.” Second, it will help bring the perpetrators of terrorism to justice. The joint statement emphasised on the need “to bring to justice perpetrators, organisers, financiers and sponsors of terrorist acts.” The terror minds are more dangerous than the terrorists committing the act. The convention will help the international community, under the guidance of the UN, to nab these masterminds and penalise those countries which support these minds or organisations promoting terrorism from their soil. The joint statement also stressed on the prevention of the use of the Internet and other information and communication technologies for terrorist acts. The foreign ministers also underlined the pivotal importance of the UN and its 70th birth anniversary, the global organisation which evokes trust and respect from the comity of nations irrespective of divides. The ministers also called for a stable and secure global order in which developing countries play active roles in decision-making. Towards the evolving world order, groups like BRICS and G20, of which these three countries are members, have played an important role. Russian Foreign Minister Sergei Lavrov emphasised that the RIC nucleus has further expanded to form the BRICS. RIC, BRICS and G20 have on many occasions reiterated their call for a fair, just and stable world order in which unilateral state intervention will have less scope. They called for the reform of international bodies, including the United Nations and international financial bodies. The joint statement emphasised that the UN Charter, along with the five principles of coexistence, mainly based on the principles of cooperation, non-intervention and respect of sovereignty and integrity, should be the governing principles of the world. Russia and China expressed their support for India’s greater role in the United Nations and APEC, and supported its full membership of SCO. India’s aspiration to be a permanent member of UN Security Council is well known. Russia has been an active supporter of India’s aspiration, while China is restrained in its support. However, this is a positive sign as China openly supported India’s aspiration. With India’s inclusion as a permanent member in UNSC, the RIC as a collective body can play a more active, and coordinated, role in the global decision- making process. At the SCO, India is currently an observer; its elevation to full membership will make the organisation more inclusive, pluralistic, with more weight. The SCO has emerged as an important front in the wider Eurasian region in ensuring security and stability. With the inclusion of India as a full member, its influence will further spread towards south, with implications for peace and stability in Afghanistan and neighbouring regions. Russia and China also supported India’s aspiration to play an active role in APEC. On the economic front, the ministers also explored prospects of cooperation. The joint statement identified mainly five areas for cooperation: business, agriculture, disaster mitigation and relief, medical services and public health, and interaction among think-tanks. It also dealt with the prospects of cooperation in the areas of energy production and transportation, environmental protection, high tech and connectivity. The meeting helped shed apprehensions that the RIC forum is getting weakened. The joint communiqué further emphasized that “cooperation between their (RIC) countries is conducive to maintaining international and regional peace and stability and promoting global economic growth and prosperity.” As multilateral engagement and cooperative diplomacy is increasingly becoming accepted method of promoting interests, the recent meeting of RIC ministers indicates that the three countries will increase their engagements and cooperation in coming months. The next trilateral meeting is scheduled to take place in Russia in the second half of 2015. India’s Prime Minister Narendra Modi’s visit to China in May and to Russia later this year will further contribute to the joint endeavours of promoting global peace and stability.